The twisted Knights of Ilbor were banished after being corrupted by the serpent goddess Nakari. Now they've rebuilt their armies in the wastes and coupled with her priestesses to spawn unimaginable slithering horrors. Gather your courage to enter the serpentine temple, where you'll journey into the very heart of Nakari's abysmal lair to rid the world of this blight. Wrath of the Serpent Goddess is a two- to four-player Dungeoneer card game. Your character explores a dungeon that you build with map cards, while fighting monsters, completing quests, and leveling up along the way. Each Dungeoneer set can be played as a stand-alone card game, or combined with other decks for more dungeon-delving fun. 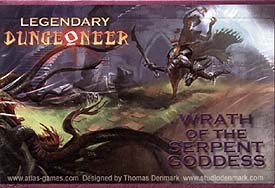 Wrath of the Serpent Goddess is the first Legendary set for Dungoneer, which lets you advance your favourite heroes from previous sets to higher levels, or play just with the new characters from this set who begin at 7th level! Wrath of the Serpent Goddess features 110 Dungeoneer cards, including Legendary-level fiendish monsters and six Legendary-level heroes for your Dungeoneer game. It plays best when combined with Call of the Lich Lord. 6-sided dice and tokens not included.